Open toe one band stapled clog. 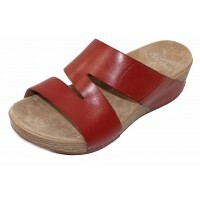 Leather linings and leather padded contoured insole. 2 1/2 inch nubuck wrapped block heel. Making shoes is not just a business, it’s an art form. More than twenty years ago wife and husband team, Mandy Cabot and Peter Kjellerup, discovered our first product in a tiny store in Europe. They realized that a simple pair of clogs would not only change their lives, but that of everyone who might wear them. So, believing that when you have something great you share it, they gave pairs to friends. Then their friends told their friends. And just like that, a comfort legend was born! Today, our 100% employee owned company based in the rolling hills of Pennsylvania, offers a complete line of footwear - heels, boots, sandals, wedges, flats and many, many types of clogs. Every pair is infused with legendary Dansko all-day comfort and support. Every Dansko product must meet the highest standards for comfort, support, durability, fit and performance. From initial sketches to final inspection, hundreds of steps take place before a pair of our shoes will make their way onto your feet. Dansko’s famous stapled clogs are endorsed by the American Podiatric Medical Associate for their erogonomic design, comfort and support.